Finding dishes to go on the side is always a challenge for me. It's not that I don't have any to make, it's that when I get excited about trying a new main dish, I don't always plan for anything else. This is a great one to have in your repertoire because as long as you keep a bag of frozen corn around, you should have everything else on hand to whip these up. I make them in individual serving dishes because the pudding doesn't look nearly as pretty when scooped out of large serving dish. Butter or spay four ramekins with cooking spray. Place half the corn kernels in a food processor and puree until smooth. Add the remaining corn, sugar, flour, salt and baking soda to the processor and pulse until incorporated, allowing the second corn addition to become roughly chopped. Add the eggs, milk, butter and pulse just to incorporate. Divide mixture between ramekins and bake for 30 minutes until just set in the center. Enjoy! I keep seeing corn pudding recipes - it is fate! I have to make it. Can you believe that I've never had corn pudding? Seriously I know that everyone else makes it, but the closest I've ever come is Spanish cornbread. Putting the pudding in individual dishes is a great idea! 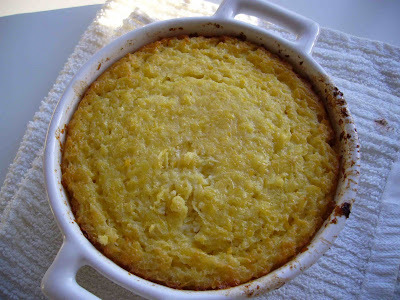 have been thinking what else i can make with corn and this corn pudding sounds good!